When building my registries, I looked to other moms for their recommendations and read through tons of reviews online. But I also knew I couldn't anticipate how the baby would like things or what would work well for our family, our space, and our lifestyle. Now that it's been a few weeks, these are what I consider to be our "must-haves" for the first month -- the things I would highly recommend. Other people may or may not agree, but in case these items could help make someone else's life easier, I just had to share! Evelyn sleeps really well in this sleeper (and has since day one!). It's nice that it folds up, moves easily from room to room, and keeps her feeling snug and secure. This blanket makes it easy to get a tight swaddle and keeps Evelyn calm so she can sleep soundly. And the special arm flaps prevent her from wiggling out of her wrap. We go through these onesies like water. With all the spit-up going on, sometimes it doesn't make sense to put her in a super cute outfit every day! You can't beat cloth diapers for their absorbency. We use these all the time for spit-up, bubbles, drool, etc. 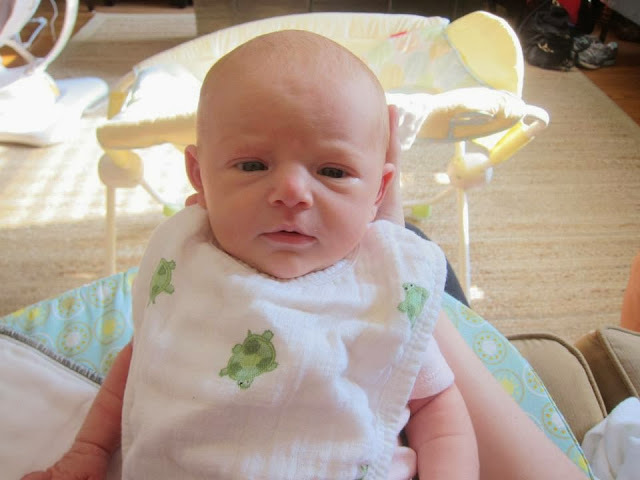 These bibs catch any dribble as Evelyn nurses or spit-up afterwards. 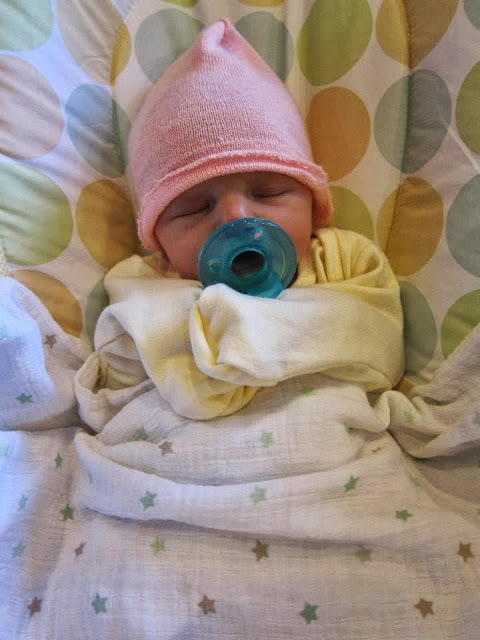 And the lightweight blankets are great for keeping her warm while she naps, shielding the sun out of her eyes, and covering her while we're out and about. The Boppy works, but I really like My Brest Friend for nursing. The flatter surface keeps Evelyn supported and allows me to have a hand (or two!) free. This style is comfy and stretchy but supportive, which is great in the early days when you're sore and your size is changing. Breastfeeding is wonderful for babies, but it hurts at first... This helps soothe the pain! No leaks, keeps my skin dry, not too bulky! We keep one of these on the changing pad to protect the cover from accidents. That way, we just toss the lap pad in the wash, rather than have to change out the whole cover every time. I read the book too, but for my husband who doesn't like reading, this (short) DVD was wonderful. It covers soothing techniques that really work! We watched it at the end of my pregnancy and it gave us some go-to moves for when Evelyn was fussy or crying. Okay, we just bought this last weekend, so we didn't have it the first month. But I wish we had! I resisted getting a swing since it takes up more room than other baby gadgets, but Evelyn loves being jiggled and rocked so we decided to go for the swing... and it was a great move! Plus when she dozes off, I can hop into the shower, eat lunch, or get a few things done. My mom stocked our freezer while she was here the first week after Evelyn was born. These recipes are super simple and only have a handful of ingredients, so I'm actually making a few more now that we've finished the ones my mom made. Pull a meal out of the freezer, thaw in the fridge for 24 hours, then toss in the crockpot for a few hours, and dinner is hot and ready! Am I missing any other must-have items for those first few weeks? i am a newlywed and am not even pregnant yet, but you better believe i just clicked on almost every single one of these and bookmarked the page on pinterest! :) thanks for sharing! This made me realize a lot more. Many people who come to this story know and are interested in this very much. I know more about this. What if there is a good story? I came here to introduce me.